tl;dr: if your site has any kind of login section, you'll want to switch to HTTPs. You should have done so a long time ago (security, privacy), but now Firefox is giving you even more of an incentive to do so. If you have a form on your website where one of the fields is of the type="password", the page will now be marked as insecure in your browser if it is served over a plain HTTP connection. Here's what a normal, secure, page looks like with a type="password" input field. And here's the new Firefox Nightly display of a similar page, but in plain HTTP (with a shameless plug to Senioren Digitaal, offering IT classes to elderly people). This change, once it makes it to the mainline version of Firefox (current Firefox is at version 41, nightly is at version 44), will make users even more aware of the dangers of submitting passwords to a plain HTTP website. Every HTTPS/TLS connection can already show you more information in the security panel in Firefox. This warning is shown on plain HTTP connections where there is no Security Panel in the inspector. If you hover over the warning, you'll see more information on why the red indicator is shown. This move from Firefox comes after several discussions of marking HTTP connections as insecure by default. I believe it's good UX to only show the insecure icon on pages where it actually makes a difference. Yes, HTTPs everywhere would be a good idea. Privacy and eavesdropping are among the most important motivators. Security is a very nice side-effect. But since not every website has a login section where passwords can be stolen, marking all HTTP connections as insecure wouldn't be a good idea. It would just train users to see a red indicator in the upper left corner and consider that the new normal. This makes no sense. If the form ACTION is https, it’s secure. The transport for the page with the login box is irrelevant. There’s no good reason to ever have a site be partially secured. If you can secure what the form posts to, why is the form not served on a secure page as well? How will this affect pages where the password field may be dynamically created after the page has loaded? What about pages that make use of a password field for non-password related things(like html tutorials or something else)? As for pages that offer HTML tutorials: the browser does not distinguish between a tutorial or a live site. If any site, by example or for real, has a type="password" form field, it’ll be marked as insecure in Firefox unless it is served via HTTPS. Perhaps it should simply not allow forms with a type=”password” to be submitted over HTTP without going through a big, scary, annoying page/popup/alert where one must click at least one, if not 2 to 3 buttons, to continue. So while the intention is good, it will make another generation of “ignoring warning users”. Such as today we have “next next next install next” and “yes, I accept cookies” and one we all do “yes, I have read and agreed these terms”. 1) I know startssl, still its allot of workload for nothing. Well said, I can only agree with all your arguments. And if you aren’t using the password field for anything other than masking the input? You might have a case for not caring about how it’s transmitted. Suddenly your page is marked as insecure for just wanting to use a feature of HTML. I really don’t see any good reason for doing anything without encryption now. TLS is necessary for HTTP/2 (yes, the spec allows it without, but no browsers do), so you need encrypted connections to get the best performance anyway, even if you have no particular need for the security/privacy benefits. I’ve been using HSTS for a couple of years, I see no advantage in serving anything over plain HTTP any more. What about HTTP pages hosting HTTPS iframes? I can think of one airline (Tunisair) that does this for entering credit card details. One field in the form of the iframe is a password input, so would this trigger the insecure warning? What about HTTP pages hosting HTTPS iframes? If the iframe is HTTPs, and it’s the iframe that contains the password input fields, there won’t be an “insecure” marker in the browser. At the same time, even though the iframe is HTTPS, there also won’t be a “secure” icon in the browser – because the parent is HTTP. Here’s what it looks like: firefox mixed content warning. I’m not sure what to think about this feature. If only the login page is secure, one can still steal the session cookie on any non-https page for a logged-in user. The only way to prevent this is to serve over a secure connection for logged-in users, right ? (or re-ask the password for any important actions but very few sites do that). 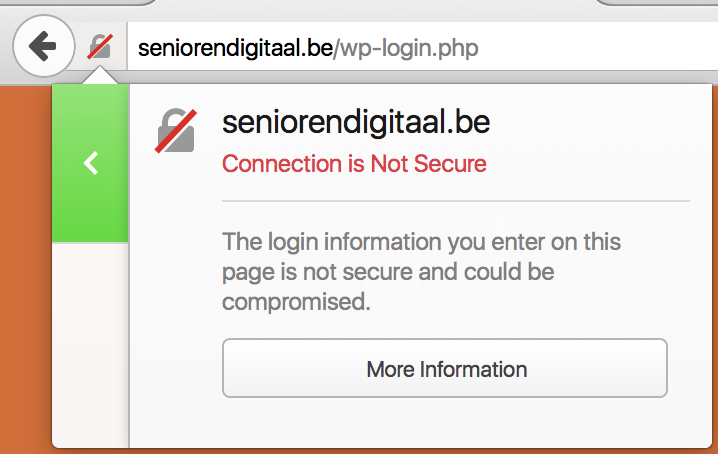 I’m afraid that devs would think that they have increased the security only by switching the login page to https. I believe this is solved by setting the “secure” flag on cookies, making them only valid on HTTPs connections. I still not understand this kind of warning. Ok unsecure but what is the risk. For example, for an e-shop where transaction go through bank website which is is https. But is it such big risk, there no credit card number, or fraud possible? In a plain HTTP site, it’s much easier to man-in-the-middle the response from the server and alter it. That could mean that the POST request for the payment no longer goes to the real bank or payment site, but to a faked phishing page that stores the credit card details. Such an attack is made a lot more difficult (but not impossible) on HTTPs. Ok but which kind of MITM are your talking about? What the probability of pirate using this posibility for a website making 1~10 transaction per day? By the way do you know which of ssl is necessary to don’t get this warning? DNS poisoning in combination with a proxy setup, that allows an attacker to modify the HTML content during transit. The probability of this happening? If you’re a large ecommerce site, chances are someone’s targetting your clients right now.